These things seem like a smart way to protect electrical systems close to the battery. I really like the idea of the fuse at the source. I need some help from one of you electrical engineer experts. What size fuse would be wise for our boats? I want to fuse the house wiring on the house battery. The biggest consumer of power on my boat (except the engine starter) is the fridge/cooler or maybe the washdown pump (9Amps). They come in sizes 30,40,50,75,80,90,100,175,225,250 and 300 Amp. Just installed a double version of one of these. One for house bank one for inverter same block different fuses. Fuse should be sized to the wire not the appliance. Using too small a fuse can result in too much voltage drop ie a 5a fuse in line of a 12g wire with a 30’ round trip run = not enough volts making it to the appliance. With that in mind the wire should also be sized to the load with minimal voltage drop @3% and not WAY oversized. yukonbob wrote: With that in mind the wire should also be sized to the load with minimal voltage drop @3% and not WAY oversized. Why should it be NOT WAY OVERSIZED? I think I have a 10 gauge wire going from the battery to the fuse panel. I assumed you can only go too small with the wiring. BTW, what sized fuse did you put on your house circuit? These guys are great (no affiliation) and their site is easy to find the continuous amp rating for each gauge of wire. Figure out your cable size from battery to switch for each bank (including starting engine if run through the battery switch). Using your wire size from your calculated loads run to your house panel and starter. Based on each cable size fuse to the cable rating. Run any 24 hour loads off a separate panel for bilge pumps alarms etc. I did one of these https://www.bluesea.com/support/article ... DC_Circuit it allows up to three 24 hour circuits with the panel off, but there are many other options. Look at Blue seas website for ideas, they have stuff you'd never even think of to solve electrical issues. You don't want 1/0 cable supplying power to a bilge pump for instance. The appliance could cause a fire or severe electrolysis before the wire or fuse burnt/blew. 10g seems small but depends on the loads. Best to run everything outside 24 hour circuits through the panel to reduce stray current, some just wire loads off the batteries (fused hopefully) so when the battery switch is turned off there's still power running to various appliances = dead battery and no bilge pump = sunk boat (not as big an issue with Macs with no thru hulls etc). I ran 1/0 to the from battery to my switch (100a breaker on panel and 250a MRFB)/1/0 to dual terminal bus (some loads off positive bus, AP/Blower etc) then 1g to house panel. 2 bilge pumps and 3 way alarm off the 3/24 hour switch circuts. They also make these for common source high amp distribution https://www.fisheriessupply.com/blue-se ... ource-5196 whcih are kind of cool as well as a similar one with independent circuits. Remember that the fuse should be within 7" of the battery/source (each run off my positive bus are independently fused fused for the given wire size and the whole bus is breaker protected at 100a. The blue seas terminal fuses are clean way to do things. These are a fairly cheap and easy way to protect a few runs coming out of a battery and work as a disconnect too. Come in a couple sizes/configurations. Yeah, what Bob said is true - wire too big makes for resistance and also will slow down the speed of breakers and fuses. I understand using larger wire to prevent melting and on some loads it is a good idea - like things with a high start current. (The starter on the OB is a really high inrush current). Compressor reefers too. Large bilge pumps can produce high start current draw if the pump is under a lot of water. I do have two DC panels in the boat - one is behind a fuse on the terminals and the other is not. The panel that is behind a terminal fuse runs lights and all the long wire runs that are not a critical device. 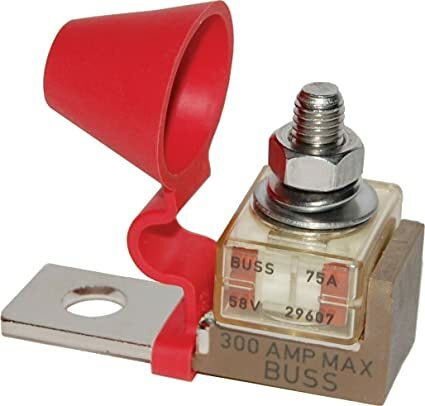 If a little light way up in the head or up the mast shorts and the panel breaker is not fast enough to shut it down before a fire the terminal fuse will catch it before combustion because fuses are very very fast by principle. Fuses use the actual heat to blow - you can't over heat a fused circuit. 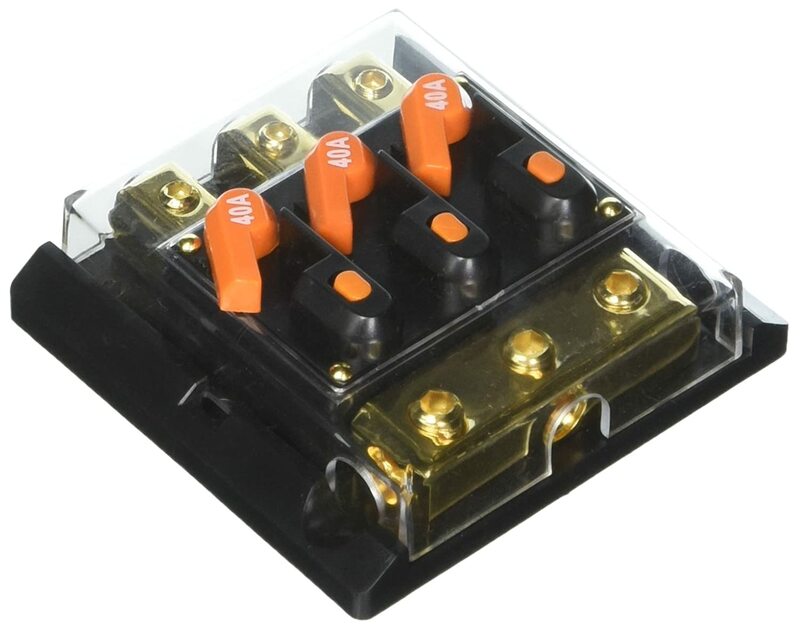 Breakers, on the other hand, rely on magnetic principles more than thermal and because the thermal sensing in a breaker is rather slow compared to a fuse - the breakers uses the expansion of a bi-metallic strip of metal to detect heat and that can be rather slow. So the fuse will always be faster than the breakers in a thermal shutdown. The panel that is not behind a terminal fuse is the panel that runs the bilge pumps and navigation. Those are the two systems I want to keep going in case I am asleep. Nav will sound position alarms, anchor alarms, and course alarms in the event of a power loss as long as the alarm circuit is live - and the bilge pump circuit? - well that does not require explanation. BOAT wrote: Yeah, what Bob said is true - wire too big makes for resistance and also will slow down the speed of breakers and fuses. Very interesting and informative post BOAT. I'm confused how thicker (larger) wire makes for resistance. I've always gone with the assumption that bigger is better with wire. That SMALLER wire creates resistance and therefore voltage drops. Next to the starter motor (which is wired direct to the starter battery) my fridge/cooler is the biggest consumer of power. It's also furthest away from batteries and sometimes struggles to start. Probably because of the voltage drop from undersized wiring. I'm rethinking some wiring. Factory wiring is adequate for the few stock lights. But not sufficient for much else. I replaced the panel source power wiring with what I thought was heavy wire. Now I'm questioning that. The panel power source wire is fused close to the battery with an in-line fuse. I don't like this in-line fuse and thought the terminal fuse would be cleaner and safer. The stock panel location (in retrospect) is a stupid location. To get power to it requires long lengths of wire. Power from it (to my cooler) requires long runs as well. For low power stuff like LED cabin lights and mast lights, small wire is probably fine. It's the heavy amp stuff that becomes problematic. I finally cracked open Nigel Calder's book to learn more. His chapter on batteries and charging is fascinating. His "tank" analogy makes this so much easier to understand. My boat is totally off grid, so all charging comes from the outboard and solar. It's given me some food for thought, however, I don't see our outboards giving us many charging options. This is the case for AC loads, but for DC more material means more resistance. AC loads are only pushing the first electrons back and forth and thus since all the electrons are connected to each other like a train when you push the first electrons up a notch it also pushes the last electrons in the train up one notch. Think of a train pushing all the train cars forward 50 feet and then stopping and pulling the train cars back 50 feet and doing that over and over. The beauty of AC current is that all it does is move that electron FORWARDS a little, and then it moves the electron BACKWARDS a little, thus it's ALTERNATING. DC current is pushing all the electrons in one direction so the further you go the more smunched up the train gets - and the more you need on the front end to get things moving on the back end. Resistance is computed differently over distance for AC than it is for DC. It's why you can't transmit electricity over long distances using DC - thus all transmission lines are AC and use very small conductors. (High Voltage vs Low Amperage). Agreed Russ, hadn’t heard big wire can cause more resistance but throwing too small a fuse inline can cause too much voltage drop (resistance) On that note don’t forget that each item you add fuse, switch, bus etc adds more resistance thus adding to more drop so a size larger wire may be applicable. If you start approaching 10g wire consider upsizing to 8g as you can then buy closed barrel terminals and adhesive shrink wrap the ends, this keeps everything out and doesn’t expose any of the wire strands to corrosion. First add up all panel loads and see where you are. Might be a good time to ad an upgrades panel if yours is getting too small or ad a secondary (one is preferable though). Calders got some good stuff as does the blue seas circuit wizard and Maine sail’s how too marine. I upgraded stock panel (measly 4) to an 8 switch breaker panel. I hate finding new fuses to replace a blown one. However, BOAT's post has given me some food for thought regarding breakers. The DC Outlets is where my fridge is plugged into. When the batteries drop a bit, I hear the fridge struggle to start the compressor. Now I'm rethinking much of this setup. I need to calculate the total distance from battery -> ammeter shunt -> switch/breaker -> outlet for fridge -> plug in fridge. As you pointed out Bob, there are many roadblocks there. Calder's got some good stuff on quality of wire also. Good wire is spendy, but worth it. If I'm allowing voltage drops to the cooler, I'm probably overworking the thing and shortening its life as well as causing more drain than necessary. I gotta get this thing more juice. I'm still going to get those terminal fuses and put a large fuse in it for safety. I guess I'm afraid of something shorting and causing a fire. That cuts it off right at the source. "Boat - but for DC more material means more resistance." Unless I read that out of context, that is not true. The larger the wire diameter, the less resistance. AC or DC. mallardjusted wrote: "Boat - but for DC more material means more resistance." ^^You are very correct. We also generally use HVAC due to historical infrastructure and tech limitations. HVDC is used globally between non-sync'd AC grids and long underwater runs. HVDC is actually far more efficient than HVAC at transmitting power but when electrical grids were first being implemented the tech to regulate DC voltage was not there and then economically limited, but that is changing. Also electrons move extremely slow through a circuit, energy is transferred via free electrons; More conductor (or better) = more free electrons = more current flow. 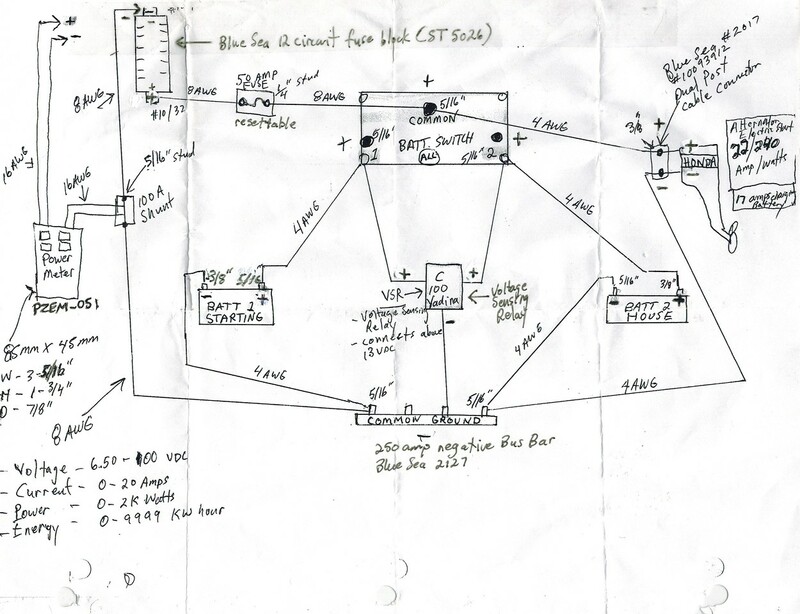 FWIW I'll throw in my crude wiring diagram for reference only from when I wired my '97 MacX. Yes, reference only. From my research using a Honda 50 with an alternator 22amp/240watts this is what I came up with. Please feel free to critique. I choose Ancor 16 AWG for powering general lights etc from the blade fuse block. Note stud sizes in the diagram for when it comes time to order the correct tinned marine lugs/connectors. The 50 amp re-settable fuse is what I went with.